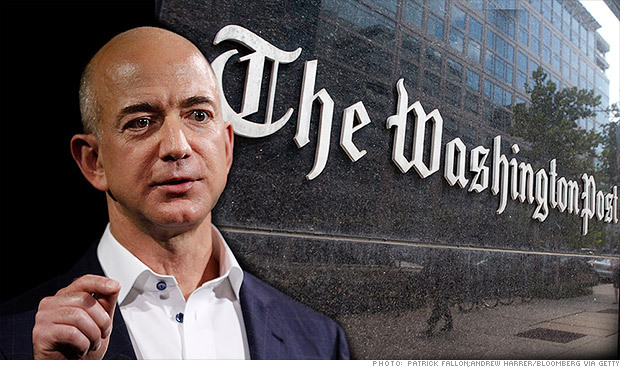 A petition that has gained more than 15,000 signers so far this week is urging the Washington Post to provide readers with “full disclosure” about a conflict of interest involving the Post’s sole owner Jeff Bezos and his newspaper’s coverage of the CIA. Currently, the Post’s coverage of the CIA does not disclose that the newspaper’s sole owner is the main owner of CIA business partner Amazon. Last month, Amazon released a statement saying: “We look forward to a successful relationship with the CIA.” For more background information, click here. McChesney is co-author of Dollarocracy: How the Money and Media Election Complex is Destroying America and author of Digital Disconnect: How Capitalism is Turning the Internet Against Democracy, both published this year. He is professor of communications at the University of Illinois. McGovern is a former CIA analyst whose responsibilities included chairing National Intelligence Estimates. He is co-founder of Veteran Intelligence Professionals for Sanity. McGovern added: “CIA secret ties with the Post and other Fawning Corporate Media (FCM) go back several decades. After leaving the Post in 1977, Carl Bernstein wrote a major story for Rolling Stone (Oct. 20, 1977) showing how the FCM worked hand in glove with the CIA and how this was all covered up by the committee led by [Senator] Frank Church in 1975. Hanrahan is a former executive director of The Fund for Investigative Journalism and reporter for the Washington Post, the Washington Star, UPI and other news organizations. A former legal investigator and currently a writer based in Washington, D.C., Hanrahan is also the author of books including Government by Contract. He recently wrote on press criticism, civil liberties and dissent for the now-defunct NiemanWatchdog.org website. Goodman is director of the National Security Project at the Center for International Policy. He was an analyst at the CIA for 24 years. His most recent book is National Insecurity: The Cost of American Militarism. Solomon is founding director of the Institute for Public Accuracy. His books include War Made Easy: How Presidents and Pundits Keep Spinning Us to Death and The Habits of Highly Deceptive Media.